First of all let me start out by saying that if you are a kibble feeder we have been where you are right now. The decision to switch our dogs to a raw diet was one that was thought out and researched. I hope that you will do the same. Your puppy comes to your home weaned onto the raw diet. 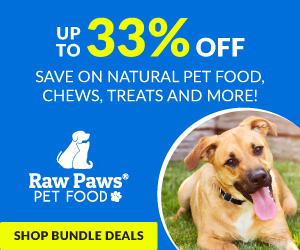 Raw feeding can be as simple as purchasing a premade raw diet such as Bravo, Stella and Chewy's, Fresh is Best or others from your local pet store or preparing meats that you buy from a grocery store. We buy prepared frozen food. Whether you get a puppy from us or someone else, consider this for the health of your own dog! and have it shipped to your home. The following links may be helpful to you as you learn more about feeding a proper species appropriate diet. Freeze dried is another option that is convenient and close to feeding raw. Some of the raw food companies also offer this as healthy choice. Are you feeding kibble? Please take the time to watch this.